Carinthia is famous for its alpine mountains and lakes, like the Wörthersee. 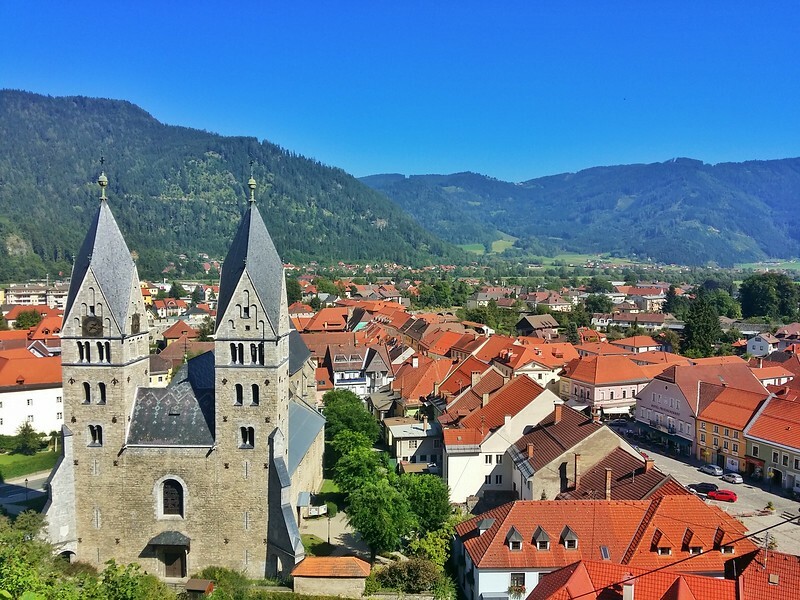 In addition, it’s also home to medieval treasures in places like Friesach that so many travellers miss out on! 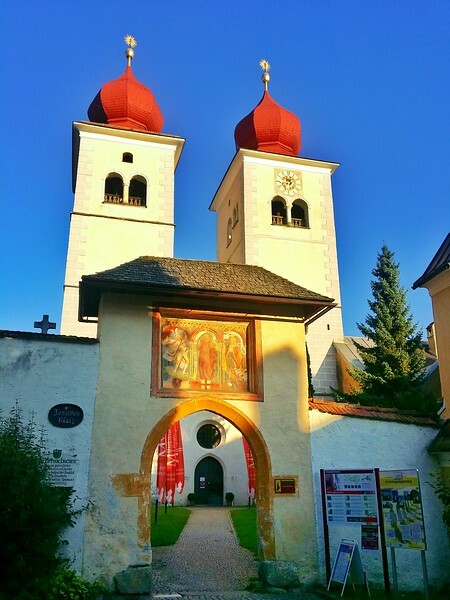 weekend guide to explore the highlights of the Transromanica Route in Carinthia. 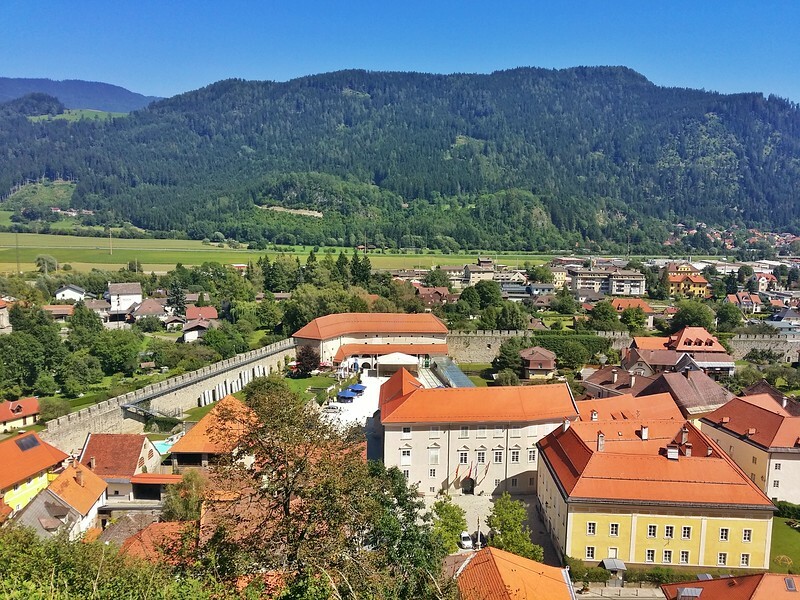 Start your Transromanica journey in the market town of Milstatt. Following a cultural route like the Transromanica, is a unique way to travel. It also ensures that you’ll see the most important medieval sites in Carinthia, which many visitors miss. Its cycling routes and hiking to the castle show how easy it is to combine an activity holiday with Romanesque sightseeing. The first few times I was in Carinthia, I explored the mountains and visited Hohe Tauern National Park. It’s my favourite national park in Austria and partly lies in Carinthia. Although I thoroughly enjoyed my time, I remained oblivious to what else travellers can find in this incredible state. That includes the Transromanica Route, which I hadn’t heard of before. The Transromanica Route is one of 32 approved cultural routes by the Council of Europe. It runs through 8 countries, features 5 Unesco World Heritage Sites, and over 400 sacred sites dating back to medieval times! The first highlight of the town is the gorgeous Milstatt Lake. It’s the second largest in Carinthia. Second, you’ll see the attention-grabbing red domes on the ancient Benedictine Millstatt Abbey. It dates back to 1070 and is a great example of the Romanesque architecture that you’ll find on the Transromanica Route. Art lovers will revel in the frescos found inside the cloister church, some of which date back to the 1400s. The frescos demonstrate the detailed Romanesque artisan craftsmanship found in medieval times. Milstatt was also one of the most important intellectual and cultural centres in Carinthia during the middle ages. Perhaps, you’ll even feel smarter, just being there :). The abbey is so serene and peaceful. Milstatt Benedictine Abbey is an excellent example of Romanesque architecture. Me contemplating life’s great mysteries in Milstatt Abbey. I’m a HUGE fan of combining active holidays with sightseeing. Fortunately, travellers have a choice of cycling one of five Tranromanica routes in Carinthia! I cycled part of one path along the spectacular Wörthersee and loved it. The Wörthersee is known as the “Caribbean of Austria” because of its warm temperatures. 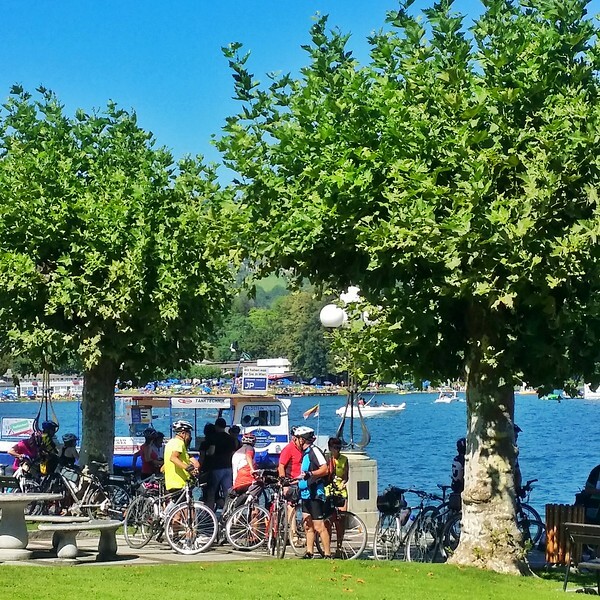 You’ll find 5 Transromanica cycling routes in Carinthia, including one along the Wörthersee. While you’re in the Wörthersee area, I also recommend a visit to the Pyradmidenkogel. It’s the highest wooden observation tower in the world at 100 metres! While it’s not an official site on the Transromanica Route, it does offer a 360 degree view of Carinthia and beyond. You can either walk up, or take the elevator. For a heart-pounding adventure, I highly recommend taking the slide down. At 120 m, it’s the longest slide in Europe! It only takes ~ 20 seconds to get down, but you’ll reach speeds of up to 25 km/hour! I LOVED the slide – even though it was faster than I had anticipated. The Pyradmidenkogel is the highest wooden observation tower in the world. 360-degree views over the Wörthersee and Carinthia from the Pyramidenkogel. 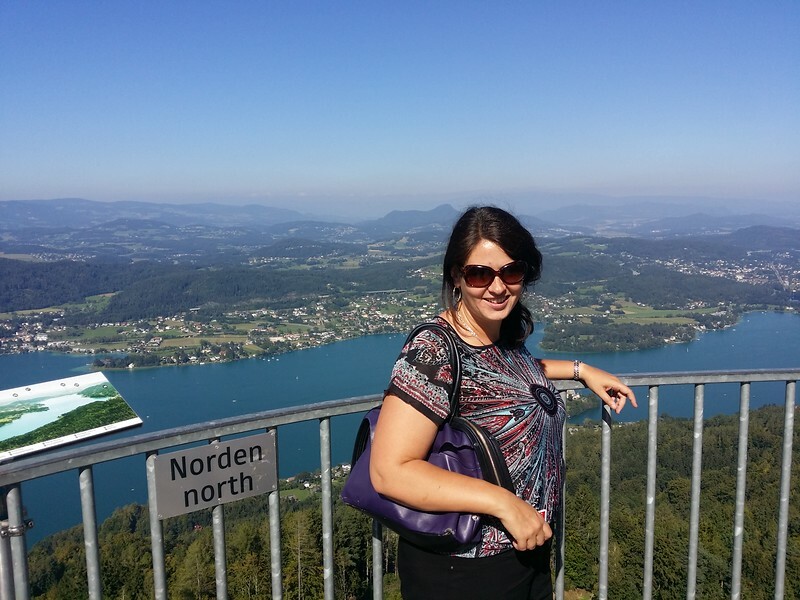 Me enjoying the expansive view of the Wörthersee from the top of the Pyramidenkogel. 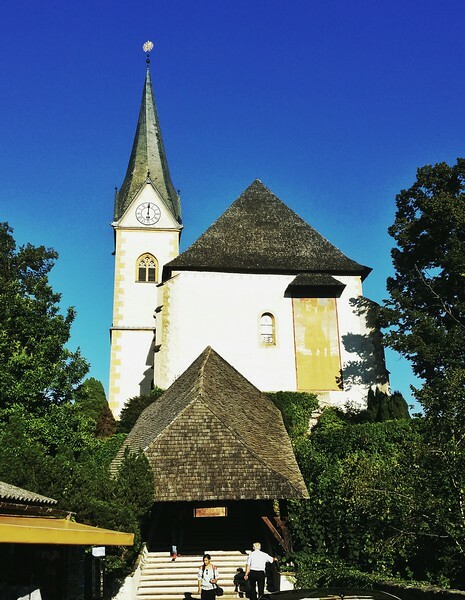 The village of Maria Wörth is famous for its pilgrimage church. It dates back to 894 and became a collegiate monastery around 1146. Centuries later, it still attracts tourists and pilgrims. There’s also a smaller church, referred to as the Winter Church where you can see frescos dating back to the 12th century. The peninsula also has a beach area where you can go for a dip in the lake. 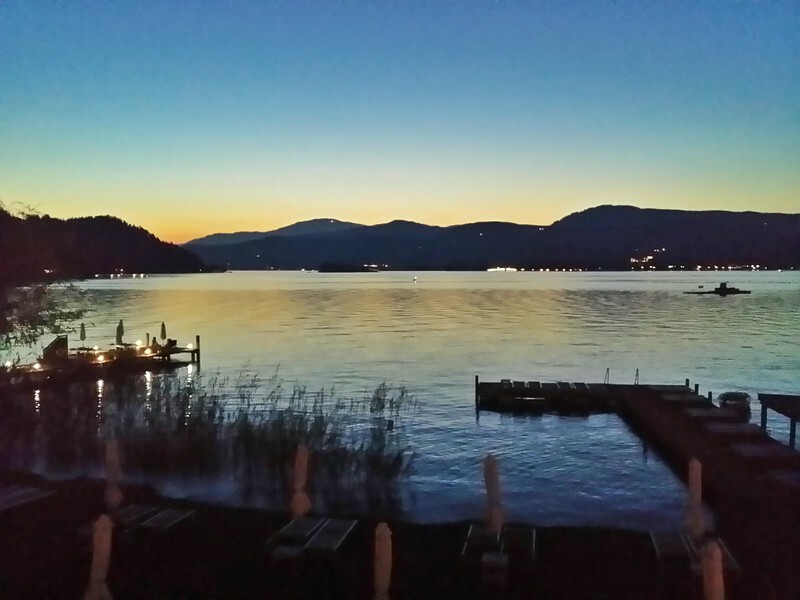 Or stay on land and take in a spectacular sunset over the Wörthersee. I highly recommend spending a night in Maria Wörth as it’s so quiet and peaceful here. Pilgrim church in the village of Maria Wörth. Gorgeous sunset views of the Wörthersee from the Maria Wörth peninsula. The Burgbau (Castle Building in English) site was one of my two favourite Transromanica sites. It’s a historical experiment to build a 12th century Alpine Castle. They’re using only medieval methods and tools with natural materials – wood, stone, sand, etc. That means no motorized or electrical equipment – nothing that wasn’t around in the middle ages. Admission is only available with a guided tour, where you will observe craftsmen, not actors, at work. It’s absolutely fascinating and painstakingly slow work. The project will take 30 years to complete. It’s a place you could easily return to each year and see the progress of the castle. The foundation for the castle being built only using medieval methods and natural building materials. 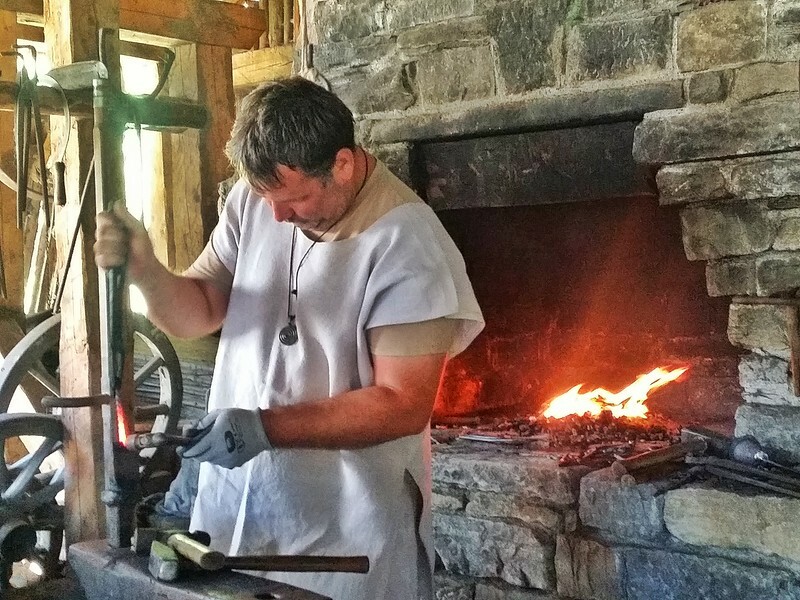 Blacksmith using only medieval tools and techniques to build the castle near the medieval village of Friesach. Admission is only available with a guided tour since you’re touring a construction site. To arrange a tour in English, email: office@burgbau.at in office. In addition to the historical experiment in building a medieval castle, the medieval town of Friesach was my other favourite stop. Not only does it date back to 880, but it still has an intact moat, an intact city wall. And of course, several historical churches and ruins. It quickly became one of my favourite towns in all of Austria. It quickly became one of my favourite towns in all of Austria. Of special interest is the 820 metre-long moat. It’s the only original one that is fully working and filled with water in all of Europe! If that wasn’t enough, you can also take a boat ride – yes a boat in a moat :). You’ll also want to do the short, but steep hike up to the ruins of Petersberg Castle! There’s a restaurant at top serving traditional Carinthia specialities. The castle’s old tower houses the Friesach City Museum. What I loved most was the panoramic views over Friesach and the mountain views. 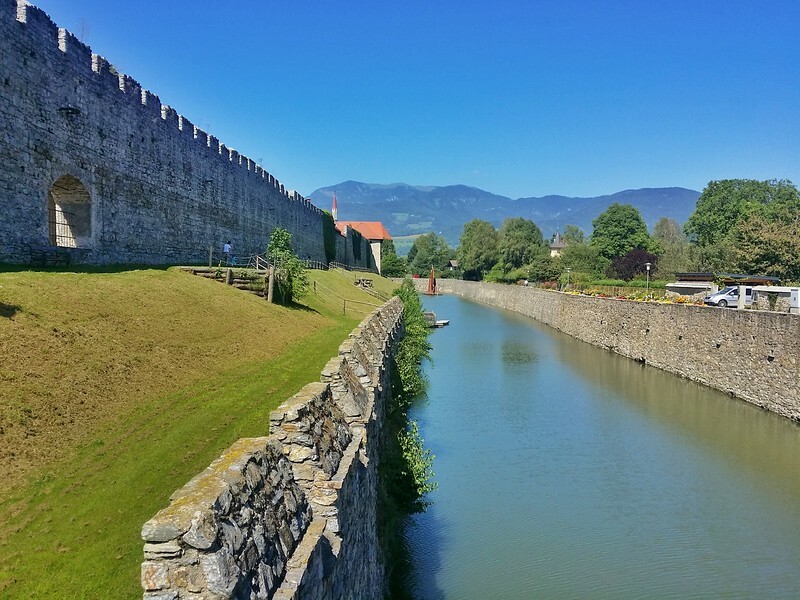 You can take a boat ride along the 820 metre-long moat in Friesach. St Nicholas, is the oldest Dominican monastery in the German-speaking part of the world. It dates back to 1217. The medieval town of Friesach as seen from Petersberg (mountain). It’s worth the hike up. The well-preserved medieval city wall of Friesach as seen from Petersberg (mountain). 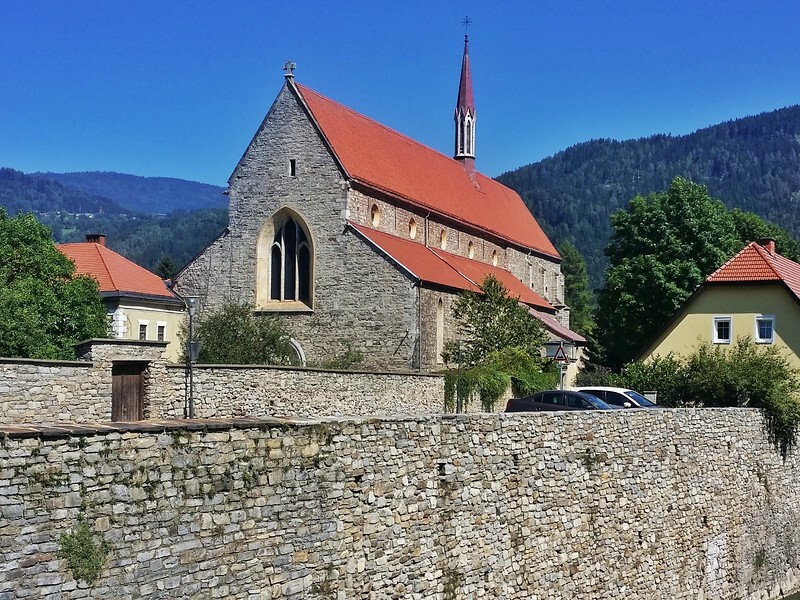 The church on the grounds of Petersberg overlooks Friesach and the stunning mountain backdrop. 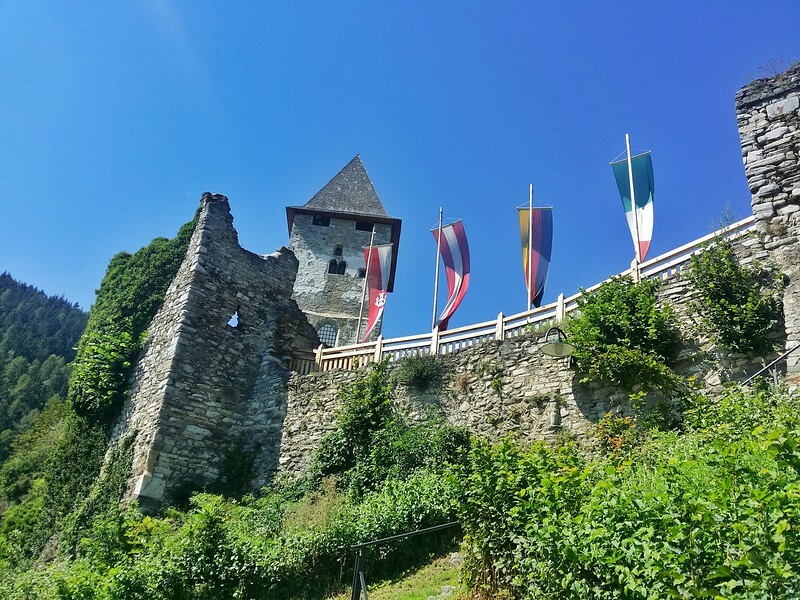 The ruins of Petersberg wall and castle are on a mountain top overlooking the medieval town of Friesach. 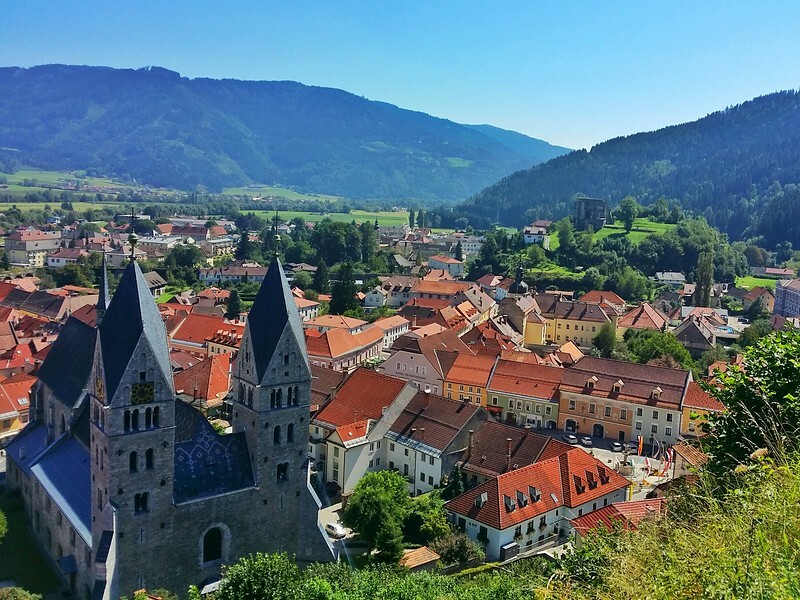 Friesach is the best-preserved medieval town in Austria. The historic centre of Friesach can easily be explored on foot. Note: My trip was made possible as part of the Crossing Routes – Blogging Europe 2016 campaign, a collaboration between the Council of Europe and the European Commission aiming at promoting the Transromanica Route, in collaboration with iambassador. All opinions are my own. Austria, the country that gave us the legend, Arnold Schwarzenegger! Beautiful post, Laurel! Love the way you describe places and things. Shows a lot of passion. Great pictures too. Thanks for sharing. @Laurel - I sincerely hope the Austrian Tourism uses Arnold's famous "I'll be back" line. Just in case they don't, would you like to start a petition for the same on Change.org? I am certain that there will be 1000s, if not million, people signing that petition. Amazing post! and great images.thanks for the sharing.